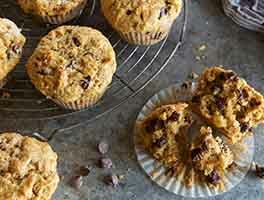 These muffins are big, high-crowned affairs that seem to explode right out of the muffin cup. We make them here with peaches, but they're also delightful made with blueberries, blackberries, or raspberries. 24 mins. to 26 mins. *Substitute Peach Jammy Bits for some of the fresh peaches, if desired. Preheat the oven to 375°F. Lightly grease two standard muffin pans; or line with muffin cups, greasing the cups. Combine the flour, salt, baking powder, brown sugar, allspice, nutmeg, and cinnamon in a large bowl. Whisk together eggs, vegetable oil, and milk. Stir into the dry ingredients. Gently fold in the fruit. Heap the batter into the muffin pan; the cups will be very full. Sprinkle sugar on top of each muffin. Bake the muffins for 24 to 26 minutes, or until they're golden, risen high, and spring back when touched in the center. 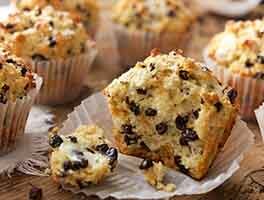 Note: Muffins baked without liners will bake and brown more quickly than those baked with liners. Remove the muffins from the oven, and cool them on a rack. Store, well-wrapped, on the counter for 3 days; or freeze for up to 3 months. 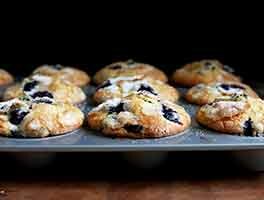 A combination of diced peaches and blueberries makes especially tasty muffins. 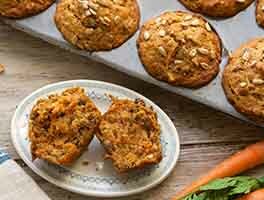 I made these muffins substituting 2 tsp. KAF Pumpkin Spice for the spices in the recipe. They are sooo good. Cooked up perfectly. New family favorite. I followed the recipe exactly and the muffins were fabulous! 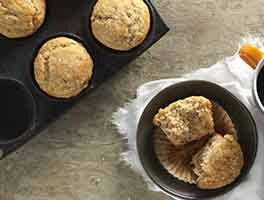 (I have made them twice - once with frozen peaches and once with fresh) My family said they were the best muffins yet. Delicious! I cut the recipe in half, worked out fine! I added a few more peaches and sprinkled the tops with raw sugar. My husband said they tasted like peach upside-down cake. Going to try the recipe with apples next. I thoroughly enjoyed making these muffins. They taste like peach to me, but I used fresh, local peaches which may make a difference on the peach flavor. I made this recipe whole grain by using a combo of white wheat flour and oat flour. I also used soymilk in place of milk, since that's what I had on hand. Will make these again! A really nice muffin. I pureed the peaches out of curiousity. I also reduced the oil by 2 oz and the milk by a smidge. The result was a nice muffin but not very peach-y in flavor. I did lay one thin slice of peach on the top of each muffin for effect and that is where I got the strongest peach flavor. I think I will try these again but dice and flour the peaches next time, maybe reduce the cinnamon / nutmeg / all spice and perhaps add some vanilla extract. Still a really nice muffin! This recipe is very good. I did make some changes. I used 2 C white whole wheat flour and 2 1/2 C unbleached all-purpose flour. I also used 1/2 C melted coconut oil and 1/4 C applesauce to replace the oil called for. Only sprinkled a little bit of nutmeg and allspice so as not to overpower the peach flavor. Added 1 C shredded unsweetened coconut and 1/2 C sliced almonds when I folded in the peaches. Sprinkled with turbinado sugar just before baking. Baked in 21 minutes. Tastes wonderful! We love this recipe. I make them every year when my peaches are ready to be picked. I'm in a higher altitude (4500 ft) so I add a little more flour. Other than that, I follow the recipe and they come out perfect every time. I wrap individually, put in a freezer bag and freeze. They reheat perfectly. Great way to use up those peaches I impulse bought in July! This recipe was incredibly easy to mix together (I didn't bother mixing the wet and dry ingredients separately, I just made a well in the dry ingredients and mixed it carefully). Before adding the peaches, the batter had the texture of a thick brownie batter but after adding the peaches it was the perfect muffin texture. 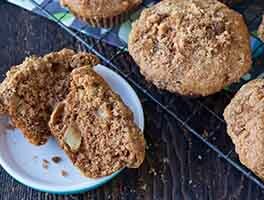 I would give this recipe 4.5 stars if possible because as another reviewer mentioned, the nutmeg and and allspice did detract from the bright peachy flavor, but I guess that's to be expected for a "Spiced Peach Muffin" recipe! I'll definitely use this recipe in the future as a base for peach muffins - maybe add some ginger for a zestier spice profile, or even lemon + basil + peach or blueberry + peach + almond! These are the best. I've made them twice now with the wonderful peaches in season. They are always gone in two days. I made it per the directions except mixed half dark and light brown sugars, as that's what I had. They are a bit dry but I think it's because I cut the peaches too small. Next time, I will cut them larger to get more peach flavor. I also won't use the same spice mixture again - probably all cinnamon. The nutmeg makes them taste like the old spice cakes my mother used to make from a box mix. Not bad, just not as bright as I think they peaches deserve. The recipe made 20 muffins and I baked them in a convection oven.